So Captain Kantner steered the Starship to the cold wilds of the North of England, where it landed in Hall 2 of the beautiful peanut known as the Sage (at least Patti Smith said it looked like a peanut when she visited). A small, but enthusiastic crowd watched in awe as the Starship rolled back the years, became the Airplane and treated to an evening of psychedelia, nostalgia and good ole west coast rock. For two hours we transported back to the ’60s and the ’70s, and classic songs like “White Rabbit”, “Miracles” and “Jane”. Kanter spends much of the night seated on an amp, still managing to squeeze those broody, meandering rhythms from his Rickenbacker. Cathy Richardson has been in the band for 7 years now, and is clearly still relishing the opportunity to sing with her heroes, and recreate the sound of Grace Slick, which she does perfectly. Cathy told us how she was a big fan of the Airplane and Starship before she joined the band, and that when Paul Kantner approached her to become singer, she showed him her stack of old vinyl Airplane albums, asking him to sign “Blows to the Empire”. For me the star of the evening was David Freiberg who still has the voice of a rock’n’roll angel. Freiberg was “once described as “the nicest guy in the San Francisco music scene,” and holds the singular distinction of having been associated with more of the original San Francisco bands than any individual, boasting membership in Quicksilver Messenger Service (1966-1970), Jefferson Airplane (albeit only for a few months in 1972), and Jefferson Starship (1974-1984), and having equally strong connections to the Grateful Dead” (Wikipedia). Frieberg performed one song solo, which I didn’t recognise but I guess must be from the first Quicksilver album (he said it was the first song he wrote) and it was incredible. He also led the band in the ’60s classic “Get Together” which was first a hit for the Kingston Trio and was written by his Quicksilver Buddy Chet Powers (aka Dino Valenti). They finished with a storming “Somebody to Love” and returned for an encore of “Volunteers”. The revolution starts here. Laura came with me and also enjoyed it. A privilege to be able to see legends up and close and hear the classics which helped shape American rock. The current line-up of Jefferson Starship is founder and leader Paul Kantner on guitar, vocals, long time member and founded of Quicksilver Messenger Service David Freiberg on vocals and (sometimes) guitar, Donny Baldwin on drums who first joined in 1982, Chris Smith on keyboards, synthesizers, Cathy Richardson on vocals (and sometimes guitar) and Jude Gold on lead guitar. And Then There Were Three…..
Come 1978 and Genesis were massive news. Firstly they were one of the biggest bands in the UK, big enough to headline the massive Knebworth festival and secondly they were in the news because their line-up changed again when Steve Hackett left to pursue a solo career. Genesis were now down to three members, and hence the album title, those being Phil Collins now vocalist, frontman, and drummer extraordinaire, Mike Rutherford on bass and guitar, and Tony Banks on keyboards. The remaining musical duties we fulfilled by players Daryl Stuermer on guitar and Chester Thompson on drums. By 1978 the Knebworth Festival was well established and the line-up for this event was pretty strong. 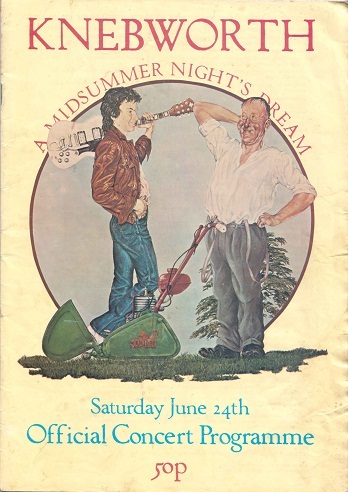 Of the other acts on the bill I remember enjoying Tom Petty particularly. In fact his set was the highlight of the day. Jefferson Starship also played a great set, which was remarkable given the absence of lead singer Grace Slick who had left the band a few days earlier, suffering from drink and drug problems. The weather was ok, warm, but not hot. Festival favourite Roy Harper was a late, unexpected and very welcome addition to the bill, coming on stage to warm the crowd up just before Genesis. The headliners took to the stage quite late in the evening, and had an amazing light show. The set was drawn mostly from their more recent albums, which was a disappointment for me, as I was hoping that they would still play some of their older material. I Know What I Like was reserved for the encore. The single at the time was Follow You Follow Me. The crowd gave Genesis a great reception with major singing along to Follow You Follow Me and I Know What I Like. 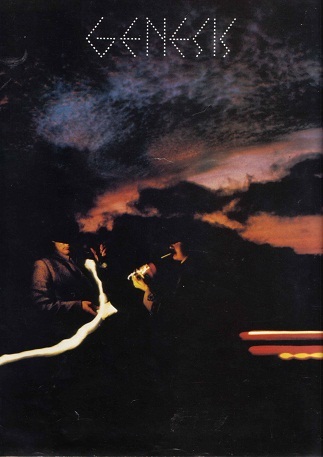 I suppose this was the point where Genesis really became a mega band in the UK, and started to move more towards AOR and soft rock, and away from the beautiful mysterious prog rock what had characterised their earlier days. Although I continued to enjoy their music and saw them a few more times, something innocent and beautiful had been lost during the journey, and it wasn’t simply about the departure of Peter Gabriel. Genesis had changed into a different sort of rock act, and I guess that night at Knebworth I realised that for the first time. I enjoyed the gig but left the field longing to see them play The Musical Box, Watcher of the Skies and The Knife. Last night San Franciscan psychedelic rock came to Blackburn in the form of the latest incarnation of Jefferson Starship. 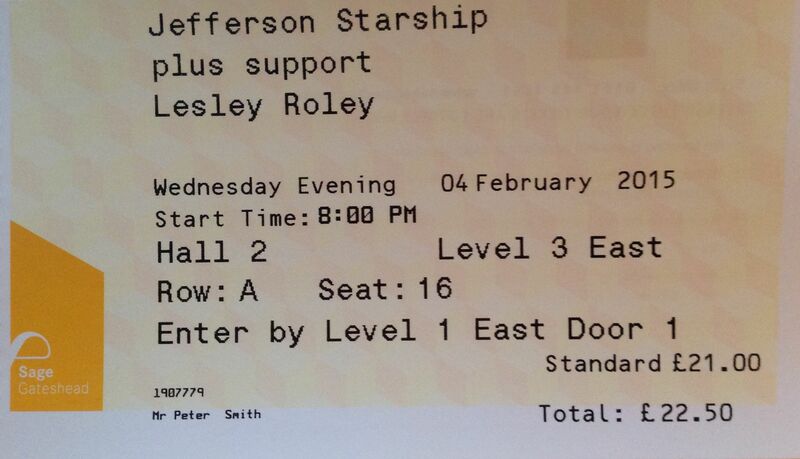 I’d promised myself that I would see Jefferson Starship the next time they came to the UK, having missed their last few visits, so last night I took a drive across the moors to King George’s Hall Blackburn for this gig. The concert was held in the Windsor room, and I would estimate that there were a couple of hundred people present. I arrived around 8.15pm, having missed the first support act, but just in time to catch a short set by local band Wagon Wheels. Their music is a mix of rock, folk and country with 5 front men and 4 guitarists. They were very good, and went down well with their home crowd. I saw shades of Mumford and Sons in their music. They had brought along their own local fans, and one of them got a big surprise when she was brought on stage while the keyboard player proposed to her. Luckily, she accepted to a big cheer from the crowd. Jefferson Starship took to the stage at around 9.15pm, starting with Wooden Ships. This line up features original Starship commander and super-psych guitarist Paul Kantner, long time collaborator and sweet vocalist David Frieberg, and the great, raunchy rock-chick vocalist Cathy Richardson. This was only the second time that I have seen The Starship, the first being at Knebworth in 1978, when they featured on a bill headlined by Genesis. On that occasion the band was going through a difficult period, and arrived late for the gig without singer Grace Slick, who had left the band a few days earlier after a cancelled gig in Germany where all the band’s gear was trashed and burned by the angry crowd. The band played without her at Knewborth, and delivered a powerful set that was one of the highlights of the day. So I was looking forward to seeing them play again after a 34 year gap. For the first few moments last night I felt the sound mix was murky, and I feared that I was going to be disappointed. 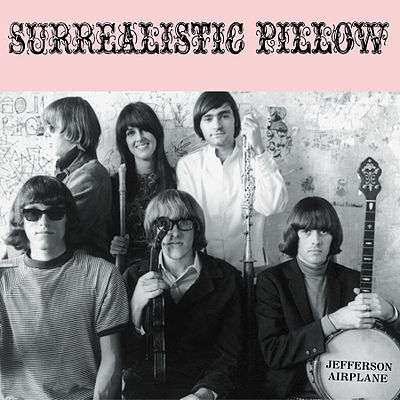 But this was soon sorted as the band settled into a set of classic psychedelic rock, drawn largely from Jefferson Airplane’s 60s catalogue. Wooden Ships featured spot on harmonies, and was swiftly followed by Crown and Creation and then the absolute classic White Rabbit, which took me back to my youth in a big way. Dated? Yes of course, but so what! These are great great songs, and part of our rock history. It was tremendous to see them played so well in an intimate venue, with a close-up view of the band. Paul Kantner is clearly the leader, although he left the stage on a couple of occasions to hand over to Cathy Richardson while she sang a couple of her solo tracks. David Frieberg also got to take the lead on a couple of songs; I was delighted that one of those was Quicksilver Messenger Service’s Fresh Air; a favourite track of mine. Brought back memories of seeing the late great John Cipollina when he toured the UK with Man in the 70s. David has a beautiful voice, and reminded me of David Crosby, who is of course, a former collaborator of the band. Jude Gold, who is standing in for regular guitarist Slick Aguilar for this UK tour, was exceptional, playing those classic psych guitar solos. Other stand outs were Get Together, Miracles, and Jane. They finished at around 11pm with Somebody to Love, Cathy punching the air and the crowd singing along. It just doesn’t get any better. Got home around 1.15am. Apologies for the blurry photo; I must get more practice with my camera phone.